Msgr. Shugrue, Diocesan Administrator, is inviting each Deanery to host a special Mass at the newly dedicated Cathedral. Our Fayetteville Deanery will celebrate Mass on Monday, September 25th, 10:00am. A bus will be provided from Good Shepherd to the Cathedral for $10.00 per person and will leave Good Shepherd at 8:00am. A Sign-up sheet is available on the Welcome Table. Payment for the bus may be placed in a separate envelope marked “Cathedral” and dropped in the offertory basket, mailed or dropped off at the Church Office. Holy Name of Jesus Cathedral in Raleigh, NC. The Holy Name of Jesus Dome is done! Get a bird's eye view of the roof, dome and bell tower. In early March, the diocese conducted another photo and video shoot of Holy Name of Jesus Cathedral, further documenting this historic project. In this new drone video, you will notice the scaffolding has come down revealing gorgeous architectural details. Great progress inside and out is being made towards the July 26, 2017 dedication. Read more about the Cathedral dedication Mass. 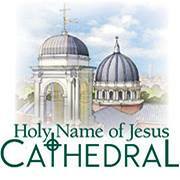 Go to Holy Name of Jesus Cathedral to stay up to date on the latest news, videos and photos. Support this historic project through the gift of religious art or liturgical items, which will have a lasting presence in a most sacred space. Contribution levels vary. Browse the catalog to view items for Holy Name of Jesus Cathedral in greater detail. All footage was captured by Flyboy Aerial Photography LLC.